Years ago, I worked retail in a shopping mall. SAFF is a little like the mall at Christmas--busy, exciting and occasionally crowded. With super crafty fiber artists! I talked indigo with a lot of folks, including one who has already sent me seeds from her indigo plants (I can't wait to plant them, Jamie!)! Eileen, who is a scientist (and whose business card I can't find) told me all about her experiments with indigo and indirubin (the red in indigo). Fascinating stuff and her dyed cloth was so pretty! Here is Ashley, aka The Feisty Redhead. She was the tech editor for my Carousel Hat pattern and she's so talented and such a sweetheart that I have become one of her groupies. She has a blog, a page on Craftsy with great tutorials, and a new book! Me with The "Feisty" Redhead. Except she's as sweet as can be! When you're at a craft show or fiber festival, you get to meet your neighbors, of course. On one side was Brooks Farm Yarn. I swear I drooled every time I walked by. Their yarn has a sheen to it that is amazing, plus, SQUISHY! Brooks Farm Trio. Beautiful yarn--this will grow up to be an amazing new design! On the other side of us, the gals from Tangled Up in Wool were busy selling felting supplies all weekend. This sort of craft is definitely above my pay grade, but they also teach classes, so there's hope for me yet. Sandy and Kristin from Tangled Up in Wool. It was like having two "Ginger the Movie Star" characters in our own version of Gilligan's Island. Since they stayed at our hotel, we also saw them early in the morning at breakfast. Yep, gorgeous then, too. The activity chez nous at Bird Mountain Creations was always interesting! Pat was busy in the booth--helping folks dye their own sock yarn and maybe, just maybe, getting some weaving done on the triangle loom. Also, greeting folks and making them smile. Tutus are always in style! LYDIA!!! I spy a Dagny hat!! Across the aisle from me was Bijou Basin Ranch. Confession: every time I walked by on the way to the stairs, I fondled the things made from Yak down. Sorry about the smudges, y'all. Also across the aisle from me was RoseSpring Farm. Look for them at The Fiber Festival of New England this weekend. Tell them Tamara said hi, and sorry I forgot to snap a picture! While on a mission on Saturday in the sales arena (up the hill from me--SAFF ain't small) I stumbled across this, the cutest booth at the show. I love the shutters, and the door and the twinkly lights. The seriously fancy yarns were pretty amazing, too! The ladies from Camelid Cottage happen to be hosting the Georgia Fiber Fest next year, so mark your calendars! Camelid Cottage. So so so cute!! Being a fiber fair, of course there were animals. I did not, however get to venture to the barn. I did see some animals, though, including Piper the Pom, who is adorable and has her own FB page. She smiled at the camera when I told her I was taking a pic. What? I thought everyone befriended dogs everywhere they went! I can't decide what was my favorite part of the whole weekend--it was really all so much fun! 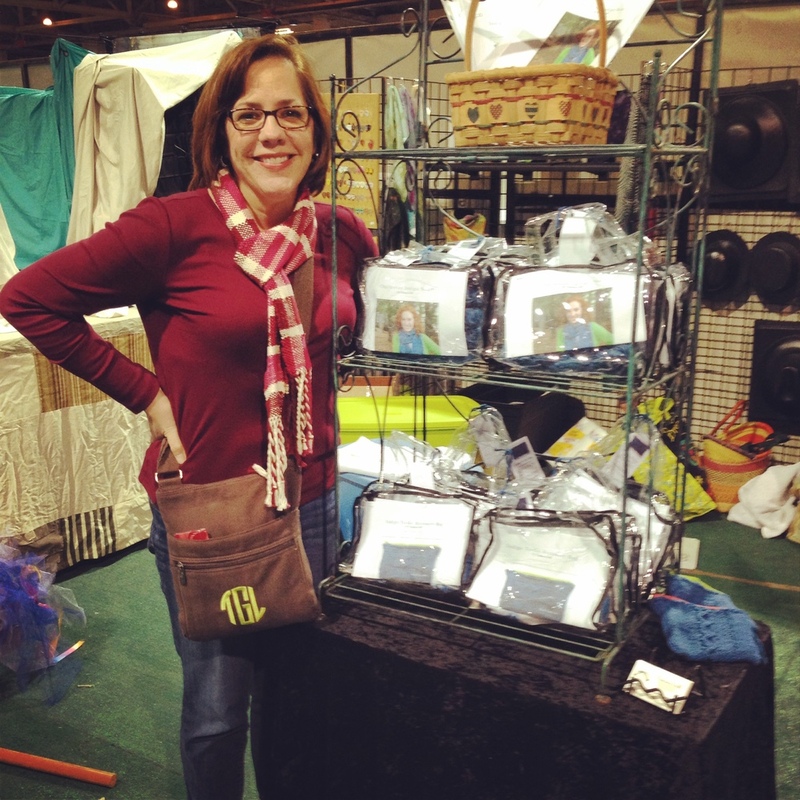 Did you make it to a fiber festival this year? What was YOUR favorite part? L-R, top row: 1.My knit-mobile for the trip was appropriately decked out. 2. Mountain skies? Yes, please! 3. Me and Pat Lorenz, somehow color-coordinating, ready for SAFF shoppers! 4. Claudia and her awesome sock yarn. L-R, bottom row: 1. Thank you for buying my kits, Corinne!!! xoxox 2. I met Starr at last year's Knit Inn and decided she fit right in. So cool to see her again! 3. One of the SAFF volunteers in THE skirt. 4. The colors, oh my!! The sunsets, the fall foliage, the knitwear (just look at that skirt! "Knit a skirt" went to the top of my to-do list when I walked in and saw this) and of course the friends, all made it so much fun. Claudia came up from Charleston to shop and take classes and dye her own sock yarn (red, white and blue--I can't wait to see how the socks turn out!) in the Bird Mountain Creations booth (more on that next time). Corinne has the distinction of being my very first customer! After connecting via social media, it was so lovely to finally meet her. Since we live near each other, we will do lunch soon. And probably knit. Starr took my Vintage Winter Shawl class at the SC Knitting Guild's 2014 Knit Inn last February, and we have since kept up with each other on Facebook. I love that she came to see me...and she bought a kit, too! Wendy from Spinsjal came to SAFF in the coolest jean jacket I've ever seen. She's always got something brewing on her blog and I wish we'd had more time to chat!! Pat from Bird Mountain Creations was as much fun to hang out with all weekend as I expected. I love her zest for living and her sense of excitement that she carries around with her everywhere. She's never met a stranger and is one of the most generous people I know. She is an encourager and a bright light in a dark world. Plus, tutus. What a weekend, right? And I've only just scratched the surface. Next time I'll show you sock yarn dying in action and introduce you to some of the lovely vendors (of which there were many!). The first day, before opening. Vendors scurrying to make it all perfect before the doors open on SAFF 2014! This is the definition of frustration: realizing that you only got pics of about half the cool people you met at the fiber festival. It was all so full-blown and fantastic, that I got caught up in the moments and forgot to pull out the camera as much as I would have liked. On the one hand, this stinks because there are some really great people that I would love to have been able to show you and now I can't. On the other hand, thank goodness I DID get caught up in the moments, because, hello??? SAFF!!!! It was great and since one day last year led to two blog posts, you should be prepared for more this year. After all, I was there for 3 days and part of one evening. And that's a lot of SAFF, I'm telling ya. Because of the long weekend of intense work and dusty mountain air, today I'm feeling slightly less spry than average (translation: I'm exhausted and pretty much just want to lie on the sofa and stream British detective shows on Netflix. All day.) So I'm going to give you a quick summary of my Amazing SAFF Weekend, move my laundry to the dryer, pour myself some more iced tea and find the TV remote. In short: It was pretty fabulous! Going for one day as a shopper was fun, but having the privilege to be a vendor was over-the-top. I loved getting to know some of the other vendors, plus having a location for folks to find me was super convenient. I met new people, saw old friends, and believe it or not, ran into the mom of my daughter's best friend from dance class, circa 2003! It made for a very special trip. The night before opening day: the setup! I also managed to sell some kits and patterns and I won't lie: that felt pretty good. A lot of hard work went into preparing it all and it humbles me to know that people were willing to add those kits and patterns to their Special SAFF Purchases of Awesomeness. I sincerely hope they enjoy knitting their projects up as much as I did putting it together for them. Thank you so much, kind knitters and indigo enthusiasts, for your vote of confidence in me. The only thing that kept me from hugging ALL of you was the vague semblance of professional cool that I was trying to maintain. Today, since I am busy packing to go to SAFF, I offer you a Blast from the Past--a re-visit to last year's My First Trip to SAFF post. Enjoy and I hope to see you there this year! Last weekend I finally made it to Saff! The Southeastern Animal Fiber Fair has been going on for 20 years, and I've tried to go in years past, honest. This year: success! So much to see! So many people! Pat slowed down long enough for a blurry pic with me. I've decided that I will start a blog one day and it will be filled with pics of me and Pat, running into each other at fiber fairs. I think that's a good plan, because Pat makes me (and everyone else, for that matter) smile, and we should all smile more, right? Buying our first Turkish spindles. The guy on the right MADE them! My goal at Saff was to find a really good Turkish drop spindle. No, make that, a GREAT one. Turns out that Knitty and Color is a wonderful source of top-notch Turkish drop spindles--well-made, beautiful, and reasonably priced. I can't recommend them highly enough! Gale, of Gale's Art, who fit right in with our crazy bunch. For roving, I went over to Gale's Art and, despite her enormous quantities of amazing hand-dyed roving in a million beautiful colors, I bought natural, sheep-colored roving. I loved it and that was all that mattered. And folks in the background wondering who I am that I've got people taking pics of me everywhere I go. Last February I taught a class at the SC Knitting Guild's Knit Inn and afterward, the lovely Gail contacted me with a finished pic of her class project. As I was walking through the barn at Saff, I saw that project and knew I had seen it before. Sure enough, it was Gail herself, and the shawl was even more gorgeous in person! Overall it was a great trip--cold, exhausting, exhilarating and fun! Do I want to go back again next year? Absolutely! Will I dress a little more warmly if the forecast high is less than 50 degrees? You'd better believe it!